Benjamin Franklin is acknowledged to have penned that dictum in a letter to the governor of Pennsylvania in 1755. While there is some dispute over exactly what Franklin meant, I will interpret it the way almost everyone does nowadays, especially in debates about the relative importance of national security versus privacy: surrendering liberty for safety may be foolhardy. But read the sentence carefully. Franklin does not say that one should never sacrifice liberty for safety. He says that “a little temporary” safety is not worth “essential” liberty. I’ve discovered that it’s useful to look at differences among left-progressives, minarchists, and libertarian anarchists through the lens of Franklin’s dictum. For present purposes, let’s broadly define liberty as the absence of aggression (that is, the initiation of physical violence); and let’s define safety as protection from the aggression of other people. At the risk of seeming to make things more complicated than they need to be, let’s try to visualize Franklin’s dictum geometrically. I hope that in the end it will help me make the points more clearly. Please bear with me! Imagine an ordinary graph with x and y for axes. 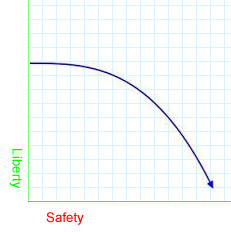 Let’s say we can measure degrees of safety on the horizontal axis so that moving to the right means more safety, and moving to the left means less safety. And let’s also say that we can measure degrees of liberty on the vertical axis so that higher means more liberty and lower means less liberty. Okay, let’s look at Franklin’s dictum again. In terms of our diagram, we can visualize what he’s saying as a downward-sloping line that looks something like a backslash (\) so that getting more safety (moving to the right) means having to give up quite a bit of liberty (moving down). 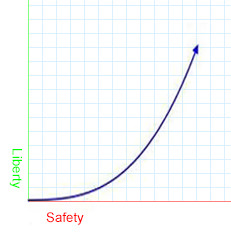 In other words, the dictum assumes that when that downward-sloping line is very steep, you won’t get much safety (which is how I’m interpreting Franklin’s “a little temporary”) for the sacrifice in essential liberty (where I’m interpreting Franklin’s “essential” as a large amount). That would be a really bad deal. But the dictum leaves open the possibility that it won’t be such a bad deal if the line were flatter, so that by giving up just a little bit of liberty, you an get a lot of safety. Presumably, such a trade-off would be less foolhardy. It might even be wise. If you’ve followed me this far, please indulge me a little further. In other words, beyond a certain point, people should exercise extreme caution in surrendering liberty. However, left-progressives, or even certain conservatives, might think the line is fairly flat throughout, so that government can provide a great deal of safety — that is, high minimum wages and massive income redistribution to address inequality or foreign wars and police militarization to protect against terrorist attacks — with little or no loss of essential liberty. That is, libertarian anarchists perhaps always view liberty and safety as complements and never as substitutes that can be effectively traded off. For them, liberty and safety always rise and fall together. So while the minarchist argument for limited government entails private persons handing over to public authorities some liberty (through taxes, prohibitions, etc.) in order to secure protection against aggression from other people, perhaps anarchists see the public authorities themselves as potentially those “other people” who, with increased political power, pose a threat of aggression against everyone else. 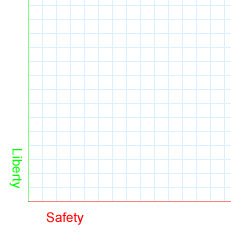 In that case, giving up liberty actually increases the threat to personal safety. Try creating a liberty/safety line based on your own political philosophy. Perhaps as you move from right to left, your line rises slightly and then falls, or vice versa. In addition to slope, however, there’s another factor to consider. Franklin’s dictum doesn’t imply anything about the slipperiness of any given slope. A progressive might not even consider slipperiness, even if she recognizes that there is a trade-off between liberty and safety. But slipperiness is an important factor to consider because a very slippery slope means that a slight nudge away from liberty could snowball into a lot of lost liberty over time, even when the slope is relatively gentle. On the other hand, if the slope is very steep but not slippery, it may be possible to give up a great deal of liberty without the fear of losing more liberty down the road. The point here is that the “dynamics” of the process of government intervention and disintervention are something we need to take into account when considering any putative trade-off between liberty and safety. Might we generalize and say that minarchists fear slipperiness less than anarchists do? By focusing on the supposed trade-off between liberty and safety, we lose track of the more relevant trade-off: us and them. If safety in this context is, as I’ve defined it, protection against aggression from other people, and if we recognize that at least some of those other people work in government, then the libertarian anarchist position is that the trade-off between liberty and safety is an illusion. The real trade-off is between my liberty and someone else’s power over me; the less freedom I have, the more power others have over my life (and the less safe from their aggression I am), and vice versa. The real trade-off is between liberty and tyranny, and the slope of that line is indeed downward. There’s another illusion. Very often we’re asked to support, vote for, or email our representatives about various political programs and causes. The underlying assumption is that we all should sacrifice some of our liberty to achieve a common goal. But often, the reality is that we’re demanding that other people sacrifice their freedoms so we can get the particular thing we want at less inconvenience to ourselves, or that other people are demanding that we sacrifice our freedoms so they can get what they want. And very often, it’s the politically privileged (and often the very rich) who set the agenda — whether about environmental protection, landmarks preservation, locavorism, rent control, minimum wage — and they are the ones who gain from those sacrifices. Again, it’s other people’s liberty that they want to sacrifice. Sadly, either through apathy or blindness, too many of us are willing to go along with such demands. More tragically still, many of us are unaware that we are actually the ones who are making some of those demands.